Rated 5 out of 5 by kerith90angel from Based on completed game (info on bonus content) The SE portion of the game took me 3 hours The CE bonus took me 40 min. Souvenir Room 6 min (unlocks after bonus play ends) Total gameplay- 3 hrs. 46min. I play all of these games on custom mode at an average pace. I always use the stopwatch on my phone when I’m playing. I try to complete the minigames but will skip them the minute I become frustrated. I’m just showing how I play because it could take you more or less time. Due to the less than stellar reviews on this game I wasn’t sure I wanted it at first after the demo. I bought it as a second CE in a buy one get one sale. I’m so glad I did. This is my new favorite game by Eipix. This game gets better and better after the demo and I had so much fun spending time in beautiful Ireland. Most of the scenes are in gorgeous outdoor locations. I would normally pick off a couple of rating pegs for this sad story (a tad too sad) but the fact there were no fantasy monsters or bizarre things in a mystery genre made me add them back. This game should have had a different title. Maybe, “Dance Macabre/ Mystery of the Irish Troupe”. I wonder where in the world “banshee” came from and believe it or not, I didn’t even demo the game for a while because I thought it would have a wailing banshee. Fear not, there is no annoying wailing creature of any kind anywhere in this game, thank goodness!! I’ve noticed the graphics by Eipix have improved dramatically since the last MCF The Black Veil. The graphics are drawn with computer assist and they were clear, with deep shadowing & just enough saturation plus the colors were great. 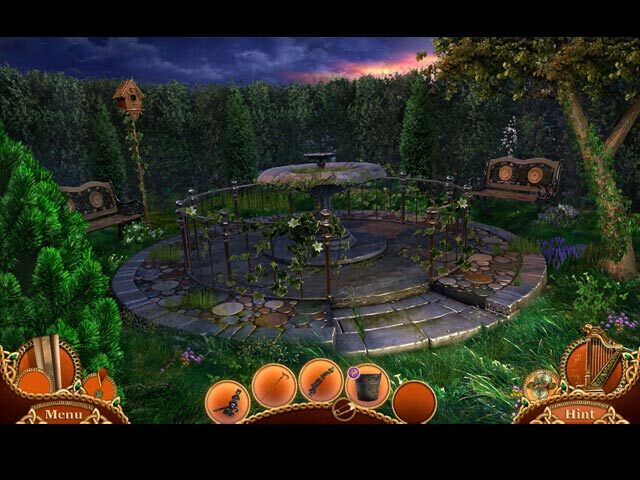 Most of the game is played at night with dancing fireflies and added touches of various effects & lighting- such as dropping leaves that did not wash out or dull a scene. By Chapter 6, dawn breaks the horizon with splashes of pink and gold in the sky. The indoor scenes were also done with care. I kept saying “Ooh, and Aaah” with each new scene. There are stained glass windows streaming the sun, a library I wish I could live in, a beautiful garden and even a mansion with a lily pond. However, I didn’t like how the characters speak in this game. I don’t mean voice acting, I mean- The character remains in the scene with blinking eyes and no lip movement, and a talking head is on one end of a text box whenever someone speaks. I just prefer when they speak from within the scene or are zoomed in on the face/head area with a blurred background. I found it distracting to have the actual character still standing in the scene without moving at all. REMARKABLE MG & HOS- Chap. 2 has a HOS with matching the interior of various snow globes to a written pamphlet descriptive. Chap. 2 also has a great HOS with an aerial scene of a group of people holding colorful umbrellas. Chap. 3 had a MG I liked where you have a note and first you compare writing comparisons between 2 text items and the second part was to compare letters in each. There is a great narrated HOS at the train station in Chap.3. In Chap.4 pg.3 you find a photo album where you must locate the highlighted words in these photos. It had multiple pages and it was so realistically done. You learned more of the story and connected with the photos/characters and I thought it was brilliant. Chapter 4 also has an aerial type maze over a garden that you must direct your character past baddies through, in 3 different scenes. It was really addicting and not easy by the 3rd one. The end of chapter 5 had a good dexterity type “fight” scene where you must bypass several moving swords and accumulate several light spots. MUSIC- is also beautifully done. Several tracks are haunting, with harps and bagpipes. Some of the songs reminded me of the movie Titanic. There are 9 downloadable tracks and each is longer than most gaming DL. They are tracks you actually want the CE content for. I saw two composers that created the music & it is way cool that you can hit a pause button during the credits to see them. BONUS PLAY: I play the same character in bonus that I was in the main game, Shannon’s daughter. This time, I must save, Cillian my cousin, and get us both safely to my parents friend, Robert Flannigan who also has a dance company we hope to dance in. There are 8 areas to play in bonus. 3 areas are very slightly revised OLD AREAS, and there are 5 NEW AREAS. There are 4 HOS (2 are only list finds in secondary windows), there are 4 more MG. COLLECTIBLES- You continue collecting the signs in each new scene & the morphs in the HOS into the bonus play. The signs you collect also end up in their own scene that unlocks after bonus play. Bonus play is shorter than most CE’s & took me just shy of 40 minutes. TO GAGE THE LENGTH OF BONUS PLAY: The demo was Chapter 1 (this demo took me exactly 45 minutes to finish), and takes up 7 pages of the WTG…..and the bonus play is 6 pages long. This game has 6 chapters, & a bonus chapter and the WTG is 35 pages total. SOUVENIR ROOM: Unlocks after you finish bonus play. 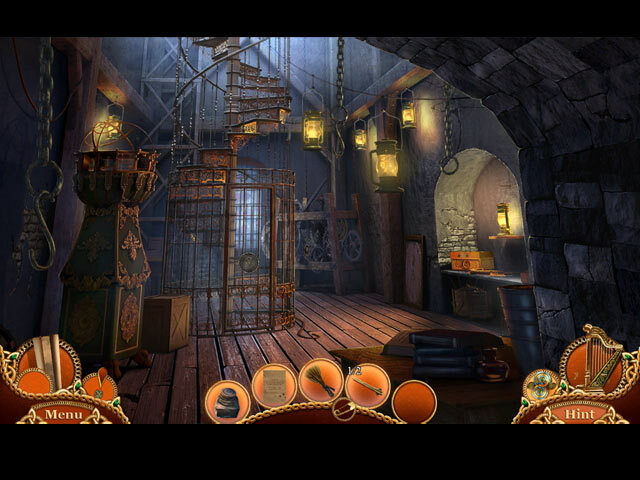 You reopen each of the 30 gorgeous scenes in this game and hunt for one object in the scene. They end up on two shelves in a scene within extras. It took me 6 min. to do this. These are a couple of other games that come to mind that also had consistently beautiful outdoor gameplay in a specific country/location…. So instead of Ireland, maybe check out Tibet & China with these two games here at BFG. And both are more grounded/mystery genre, like this game. 1. Enigmatis 3- The Shadow of Karkhala (set in the Tibetan mountains) I’ll add a link… 2. Mythic Wonders: Child of Prophecy (also way better after the demo) Thank you BFG; and a huge thank you to Eipix ~ This is my new favorite game by you! Rated 5 out of 5 by 1955raven from EIPIX HAS THE LUCK OF THE IRISH.......... WITH THEM IN THEIR LATEST ADDITION OF DANSE MACABRE. BEAUTIFUL GAME! EXECELLENT PUZZLES,MUSIC ETC.BASED ON TOTAL GAME. Rated 5 out of 5 by Marja67 from Screamin' Mimi, no. I remember this from the Beta checkups. Graphics are good. I feel it's easy to navigate through. I bought it. Rated 5 out of 5 by jane_eb_1952 from Is She A Bride Back From The Dead? Or A Mad Banshee? What ever she is, I am quite interested to find out. Eipix Entertainment provided another great fun game for me. This game holds a lot of suspense, and unanswered questions. While playing the demo, I could not help but to enjoy the Irish music, which added a matched flair to the Irish Step Dancers, and their title, "The Swift O'Connors," great fit. The graphics are great -- real eye candy. The morphing objects and the hidden collectible insignia were not too difficult to find, but still enjoyable. The puzzles were challenging just enough to hold my interest. The storyline is very good; almost original. This is really a fun game with one exception, which I agree with some of the other reviewers, that it ended rather quickly. I still had 34 minutes left to play, and I got up for a drink and came back. At any rate, I am still hooked on finding out what she is, and why she is doing what she's doing, so I will be purchasing this game in the near future. I think this is a good game. Rated 5 out of 5 by cherleadford from So Very Enjoyable How refreshing to play a wonderful game with such crisp graphics. Everything in normal color. I enjoyed this demo very much and will be buying the CE for sure. The story line kept my interest. Even though the puzzles were not extremely challenging, I still enjoyed them. The demo seemed to be pretty short even with doing all the puzzles, it said I had 45 minutes left. Others give a much more in depth review, so I just wanted to say I really like the game and well worth the buy. Rated 5 out of 5 by biscuitsmama from WHO IS THE VEILED WOMAN IN THE WHITE DRESS? IS SHE REAL OR A GHOST? Does Finn O’Connor truly see a banshee in the audience of his dance performance or is it just his imagination? This is only one of the questions you must answer as you play this excellent new Danse Macabre game – Curse of the Banshee. Curse of the Banshee is the eighth game in the series and from what I played in the demo, it promises to be an excellent game. Because I really want to know about Finn’s relationship with the woman in white the game is an instant buy for me. Technical aspects of the game include excellent graphics and realistic voiceovers and soundtrack. There are four modes of gameplay including the custom level where hints recharge in a range of 10 to 120 seconds and puzzle skips can be set in a range of 10 to 400 seconds. Your tools include an interactive map that you acquire early in the game. The HOP scenes are varied and excellent although there is nothing new. I found the scenes interesting to play and very well crafted with maybe a few new touches. However, if you don’t enjoy searching for items in the HOPS, there is an alternate match-3 game available. The puzzles were excellent and included some that I haven’t seen before. 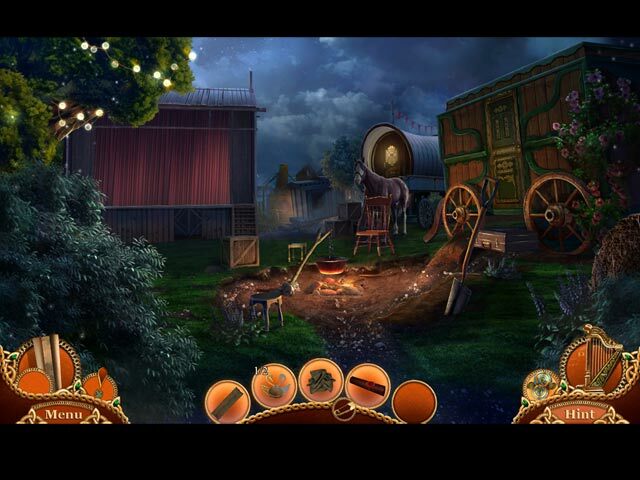 It is always fun to come across a puzzle in a HOPA game that is something new because it presents a new challenge to the game. Even though many of the puzzles are those we often see, they are still fun to solve. Generally when I play a demo I will use the skip button if I don’t want to chew up time but I didn’t skip any puzzle during the demo this time. Some were entertaining so I didn’t mind chewing up the time. There are a couple of puzzles that I really enjoyed – one was getting the dance steps in the correct position and another was to repair a wooden bridge. The game includes 14 HOPS and 19 puzzles. If you prefer the CE version of a game, this one includes: Collectibles and Morphing objects to find, as well as achievements to earn. The remainder of the extra content is fairly standard with a bonus chapter, 37- page strategy guide, wallpapers, concept art, music, replay of HOPS and puzzles, and a souvenir room. Sometimes the Danse Macabre games are hit and miss but the last two games have been quite good. I think that Curse of the Banshee is one that I might enjoy more than the others in the series. I rather like the Irish theme to the game and the folk tales that may evolve during gameplay. Even though I am sure this will be a game I will enjoy, please try the demo to see if this one is for you. Happy gaming!